Ms. Wilson is a research assistant/consultant for the Center for Positive Early Learning Experiences at the University of Colorado at Denver. She is currently working on the PTR (Prevent-Teach- Reinforce) grant and the Learning Experiences: An Alternative Program for Preschoolers and Parents (LEAP) Outreach Project, providing consultation and training to elementary schools and preschools serving children with autism and challenging behaviors. Over the last 13 years, Ms. Wilson has been involved in almost every aspect of early intervention, general education, and special education. She has extensive experience as a trainer for children with special needs and challenging behavior in inclusive settings. 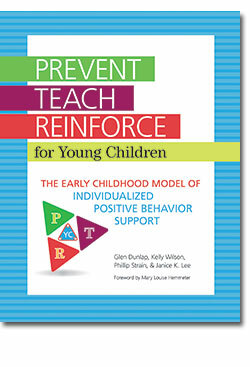 This practical, user-friendly guide shows you how to improve the social-emotional development and prevent challenging behaviors of young children. Using the PTR model—prevent behavior problems, teach proactive communication and social skills, and reinforce positive behavior—is a proven, highly effective approach.